A very well known proverb from Heraklit of Ephesus (approx. 540 – 480 B.C.) says: “Nothing is as solid as change.” Very wise words that still have validity. That we live in times of rapid change can no longer be denied. Agility, flexibility, creativity, development and vision have by now become essential qualities that decide whether companies will be of sustainable existence in the future or not. The worldwide New Work movement clearly shows that it is time to change the working world and the cooperation in organizations. Why is work for most of the employees anything else than fulfilling? What are the outdated rituals and routines Hamel mentions? In my article „Do companies without hierarchy really exist? – Clarity about a Mistakable Term in the New Work Movement“ dated 15th of April 2017 (see http://www.viva-essenza.com/216) the differences between classical hierarchy and sustainable network organizations have been described in detail, as well as the necessity of creating more flexible organizations and dissolving bureaucracy. Yet, visionaries and courageous edgeworkers are over and over facing resistances on their way of establishing a progressive company culture, a new kind of leadership and an evolutionary organizational structure (i. e. those heading towards a network organization). Second, there are millions of managers who have a vested interest in perpetuating the status quo. Bureaucracy is a massive, multi-player game and those who excel at it are typically unenthusiastic about changing it. Someone who’s invested 30 years in acquiring the power and privileges of an executive vice-president (or department leaders) is unlikely to look favorably on a proposal to downgrade formal titles and abolish the link between (hierarchical)rank and compensation. Third, there’s no well-trodden path for building a post-bureaucratic organization. While one can draw inspiration from companies that are famously non-bureaucratic, like Morning Star, the California-based tomato processor, and W. L.Gore, the high-tech materials company known for its Gore-Tex fabrics, these companies developed their distinctive management practices over decades. While there’s much to learn from these and other vanguards, any bureaucracy-bound organization that wants to overhaul its management model will have to invent its own map. The challenge is not unlike that faced by the first surgeons who attempted to transplant human organs: the stakes were high and the protocols few. Busting bureaucracy requires finesse, not brute force. If you want to reduce the bureaucratic drag in your company, you’ll need an approach to change that is emergent, collaborative, iterative and prudent. The key: revolutionary goals and evolutionary means. However, exactly these revolutionary goals and evolutionary ways are not easy to go. It may even happen that great progress is made in a company and that employees are inspired, but that in the end these progresses are blocked by the majority shareholders, who turn out to be denying forces that want to stick to positions and crusted management strategies. It is not rare that the insistence on old management structures prevents change in companies. Just as Hamel describes it in his four points it is understandable that managers or CEOs try in the end to fight evolutionary change, since they have been acting in a netting of competition and single fighters for years where it was about who wins and who gets the highest salary, the company car or other bonuses. What’s behind the prevention of change is the fear of losing the known that has worked for years or even decades. This fear is quite understandable. Human beings identify with their worldview. Having a specific worldview gives you assumed security, because it clearly defines how things work. It is just the same with hierarchical structures and management strategies. If they are to be broken up or replaced, the fear of the unknown arises. As Hamel describes, there are no specific, generally practicable concepts of how a new company structure and culture could look like. These have to be individually designed for each company. How should you trust that a change from e. g. a hierarchy towards a network organization will work if you haven’t experienced it yet? 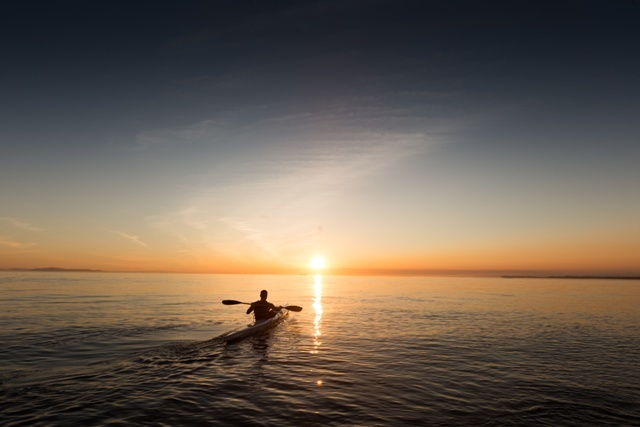 This means that an essential aspect on the way to New Work includes the ability of standing in not-knowing and trying new things without knowing how it goes. It is about flexibility and creativity, about stepwise trying and rapid learning. What’s in the end behind the fear of change (and thus the fear of losing control and security) is just one thing: the fear of fear! In modern society – and specifically in business life – people are told that feelings are not wanted and not okay. No matter if it is anger, joy, sadness or fear, they are all considered to be unprofessional. We learn that fear has the following characteristics: it is miserable, irrational, instable, cowardly, impulsive, hysterical, nerve-wrecking, paralyzing, powerless, weak, incompetent, unprofessional, etc. From this point of view it is more than understandable that employees and managers are afraid of fear. If it is not okay for someone to feel fear then it is not possible for this person to support deep change processes. However, fear is an essential part in a change process. 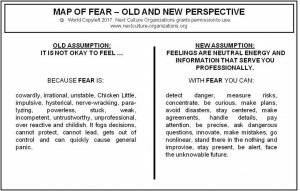 Supposed that fear is – just as the other feelings – neutral energy and information that serves us, it is possible to use fear consciously to e. g. ask dangerous questions, stay in total nothingness, evaluate risks, be innovative and courageously step into new territory. The feeling of fear is an absolutely necessary power to be able to navigate through change processes. The change in progress cannot be stopped. It is therefore up to the employees to decide self-responsibly whether they are willing to step into the flow of change or rather try to cling to old, known structures that will collapse sooner or later anyway. New Work, it is not about throwing all aspects of past management over board. The opposite is the case. In the New Work movement it is about breaking up old structures, develop them further and generate new possibilities so that each employee can bring in their full potential, experiences inspiration and enthusiasm at work and that the organizations can head towards sustainability. It is about creating new possibilities and perspectives so that employees work with enthusiasm and passion for a bigger vision through a changed self-understanding and new consciousness. It is time to recognize that the crusted structures and out-dated procedures have reached their limit. The young generation starting to work in companies right now is no longer willing to sacrifice their lives for organizations in which they get gagged through rules and discretionary powers anyway. The new generation is looking for enthusiasm, inspiration, power, the possibility of bringing in their talents and a healthy work-life-balance. They no longer tolerate rigid structures. An interesting question is this: What is necessary so that objection raisers and denying forces can come on board? Is this actually the goal? Probably it is not even about getting everybody on board. The New Work movement has progressed too far already, it cannot be stopped. Maybe the fight of the denying forces against change is like a last rear up of the patriarchs. In politics you can currently observe the same thing. Where somebody tries to impose manipulating, dictatorial procedures on others, people start walking the streets together and taking a stand for something bigger that serves all. Like the German historian Michael Richter (*1952) says: „What stays is the change; what changes stays!” To fight against change is in the middle and long run everything else then conductive. It makes life harder instead of easier. Are you ready to step into the flow of change and live the change?